Severn Stars shooter Georgia Rowe says the upcoming fixture against her former club Celtic Dragons is “massive” after the frustration the team has felt over recent results. The Severn Stars face their third game in eight days as they take on Celtic Dragons on Saturday (March 30, 4pm), away in Wales. After tough defeats to two of the top five sides, Stars will be looking to get their season back on track with a win at the Sport Wales National Centre. However, she said she was expecting a tough match. “Dragons are a physical side and have shown real determination in their last few games,” said Rowe. “They are not a team who will give up and will pressure us right until the final whistle. Last Saturday (March 23) Stars fought back from an eight goal deficit in the fourth quarter to draw level and then take the lead against Loughborough Lightning. But they ended up losing to a last gasp goal with 20 seconds on the clock, 53-54. Then, on Monday (March 25), they were on the road at Team Bath for a postponed fixture. Although able to keep within touching distance for the first three quarters, ultimately in the last 15 minutes the opposition pulled away for a 53-43 win. Despite these results, the atmosphere among the Stars camp, Rowe said, remains upbeat. In the remaining games of the season Rowe says she wants to see the team push on for more wins. “I know it’s important to not focus on the score and to strive for good performances but we don’t train five days a week to lose and what us as players really want is to win,” she said. “We know we are capable, but it’s down to us and we will continue to work hard. Tickets for the Severn Stars home games, including Strathclyde Sirens, at the University of Gloucestershire Arena, on April 6, can be purchased via www.ticketline.co.uk/netball-superleague-severn-stars#bio. Two Welsh internationals are the latest signings to join the Severn Stars’ attacking line-up. Experienced Superleague shooters Cara Lea Moseley and Georgia Rowe said they were looking forward to seeing what Stars could achieve in its third Vitality Netball Superleague (VNSL) campaign. The pair both have experience in the Vitality Netball Superleague, having previously played for Cardiff-based side Celtic Dragons. Moseley has more than 50 caps for Wales, competing at both the 2007 and 2011 World Championships and 2014 and 2018 Commonwealth Games. The South Wales-born 6ft tall shooter, who can play at either goal shooter or goal attack, combines elite netball with her work as a psychologist and her Psychology PhD studies. South Wales-born Rowe started playing netball at 17 and has represented her country at Under 19 through to Under 21 level, and now plays at senior level. She represented Wales at the Netball World Cup in 2015 and made this year’s Commonwealth Games squad. 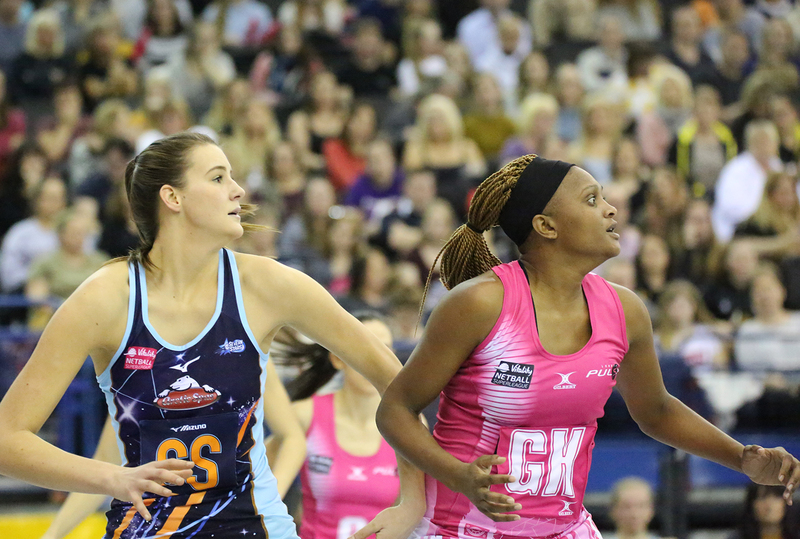 “I am so excited to be playing for Severn Stars this year, I’m really looking forward to improving my game whilst facing new challenges,” said the 23-year-old, who lives in Newport and also works as an early years practitioner. “I am looking forward to working hard and becoming a much better and more dominant shooter for my new team. This will be the 6ft 5in goal shooter’s fifth year in the Superleague after spells with Dragons and a year at Team Northumbria. Moseley and Rowe join Stars’ other signings so far, Jodie Gibson, Iona Darroch, Lucy Harris, Maryka Holtzhausen and Sam Cook.